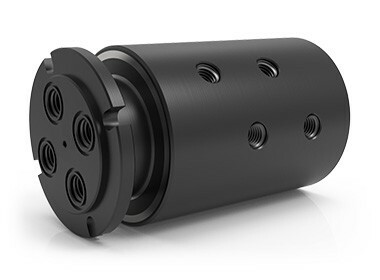 The 4-passage, GP Series rotary unions for general-purpose use, features a unique shaft configuration with threaded NPT connections and an O-ring face seal gland for flush mounting the union to an interface. They feature specialized sealing technology suitable for vacuum and bidirectional pressures and independent flow passages capable of transferring different media types simultaneously. The carbon steel (black oxide) construction is best used for hydraulic and pneumatic service, in addition to water/glycol and coolant when rust inhibitors are present.